Guangzhou Lhasa Tour, book train / flight ticket online. Guangzhou is a major city of China as well as an ideal arrival hub for international travelers. Connected with overseas countries by international flights and mainland cities by domestic flights and trains, Guangzhou is the gateway of inland China. Have your China Tibet tour from Guangzhou means you can enjoy traditional China in this fast developing city and be shocked by the massive contrast of culture and nature between Guangzhou and Tibet. Guangzhou owns unique colonial history and developed rapidly during past years, which gave it historical sites as well as modern landmarks. In Guangzhou, you can climb the second highest tower, Canton Tower, and enjoy the full view of Guangzhou city. You can gain knowledge about Chinese traditional culture at Chen Clan Ancestral Hall, and touch the modern history of China at Sun Yat-sen Memorial Hall. As a modern city, Guangzhou offers exciting nightlife. Circus shows will feast your eye while yummy snacks at night markets will satisfy your appetite. After your marvelous exploration in Guangzhou, you can transmit to Tibet conveniently by plane or by train. Trains depart from Guangzhou at 11:45 every other day, and 2 days are needed for the journey with covers a distance of 4980 kilometers. Domestic flights are always available at Guangzhou Airport, the journey takes about 14 hours with one or two layovers. In Tibet, you will never miss the must-see sites in Lhasa. The tour will take you to the great Potala Palace, the sacred Jokhang Temple, the busy Barkhor Street, the huge Drepung Monastery, and the unique Sera Monastery. To extend your journey to remote areas, you can also see the highest peak in the world - Mount Everest - in person, and kora around the holiest mountain of both Hinduism and Tibetan Buddhism - Mount Kailash. All in all, join a Guangzhou Tibet tour will not only offer you convenient transportations but also provide you a rewarding travel experience. This tour will take you from modern city, Guangzhou, in the south of China to the holy land, Lhasa, in the west of China. In Guangzhou, you can visit attractive landmarks before departing for Tibet. In the train, the breathtaking landscapes along the Qinghai-Tibet railway will be highlights of your Tibet tour. There is only a pair of non-bullet trains (Z264/Z266) running between Guangzhou and Lhasa, the trains from Guangzhou takes around 54/55 hours to cross 4,980km to reach Lhasa. As the longest train route from the south China to Tibet, you will have a great chance to see the charming scenery in 7 provinces of China. Is there any train to Tibet from Guangzhou? Yes, there is a direct train running to Tibet from Guangzhou. Z264 departs from Guangzhou Railway Station at 11:45, and arrives at Lhasa Railway Station at 16:19 on the 3rd day. It takes 52hrs 34mins to finish this 4980 kilometers’ long trip. It runs every day. There are three kinds of train tickets including hard seat, hard sleeper berth and soft sleeper berth. Since you will stay two nights on the train, soft-sleeper is recommended for ensuring your comfortable train journey. How about flying to Tibet from Guangzhou? Flying to Tibet is the most convenient way, and it's the choice of most travelers, as taking a train to Tibet takes very long. At present, there is only one flight with a stopover in Chongqing flying from Guangzhou to Tibet. This daily flight is operated by China Southern Airlines. It departs from Guangzhou Baiyun International Airport at 08:10, and arrives in Lhasa at 14:05. It takes you 5hrs 55mins to arrive at Gonggar Airport in Lhasa. You can also transfer flights in other mainland cities, such as Kunming, Xián. What’s the best time to visit Guangzhou and Tibet? Guangzhou can be traveled all year round. 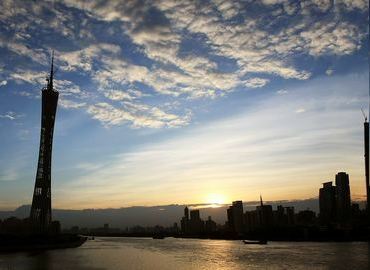 And the best time to visit Guangzhou is in fall with balmy weather and the most comfortable temperature within the year. However, it mainly depends on your budget, personal interest and the your time schedule. If another time suits your better, you can also go there. While the best time to visit Tibet is from May to October. During those months, the oxygen content is higher, the weather is warmer, the sun is bright, you can enjoy the most beautiful scenery in Tibet. In summary, visiting Guangzhou and Tibet from May to October is recommended.